This year to celebrate International School Library week, our students have worked day and night. They had put up assemblies, an exhibition on international sports including coming up Common Wealth Games to be commenced in 2014 at Glasgow, Scotland. Highlight of the exhibition was 'Wall of Fame". This Wall had been decorated with success stories of students who had not only scored in academics but also in sports. Now you must be wondering that I am writing only about sports and Common Wealth Games etc in Library week activities. Dear friends, this year we connected reading with sports. We wanted to convey that good reader can be a focused players and that Good sports person can become better by reading and develop many more skills and capabilities. To mark the importance our students from Middle and senior school had compiled information on 27 international sports in CD and e book format. They have named it ‘Goenkan Encyclpaedia of Sports’. The same was released in one of the assemblies in which reading and sports were emphasized. We had also designed an innovative competition in which middle school students created photo stories of their favourite sports heroes. Our PYP and MS students (all of them) participated in book Marks Exchange program by swapping Book Marks with students of six countries-Spain, Portugal, Republic of Ireland, Australia, Canada and Croatia. A Book Fair had also been organized on 17-18-19th October which highlighted collection of books on Sports. 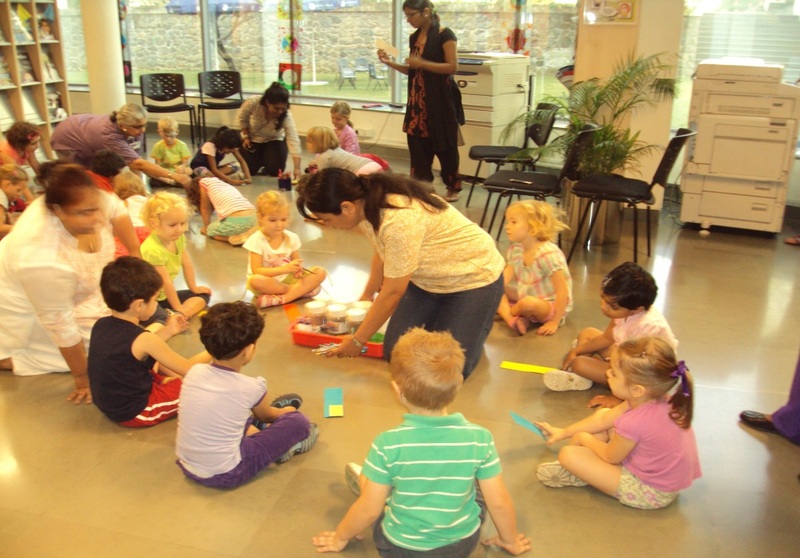 The Library at Kendriya Viyalaya Pattom, Kerala, India has been celebrating the International School Library Month with two exciting programmes. 1. International Bookmark Exchange Project with Schools in Hungary and Croatia: Bookmarks created by the students of Kendriya Vidyalaya Pattom were exchanged with that of Francis Kolcsey EVN General Baptist School (Hungary) and John Ranger Elementary School, Kamenica (Croatia). Ten bookmarks were exchanged from the age group 11-12 and 20 from the age group 13-14. 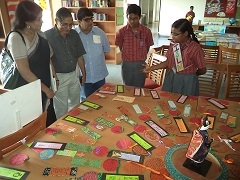 The bookmark designing contest had more than 120 participants. The selected students were excited to see the exchanged bookmarks and sending their own to Hungary and Croatia. (photos attached). 2. "Gift A Book and Get A Friend": There is no better way to make a friend but gifting a book. That was what the members of Readers’ Club at KV Pattom thought when they collected books from students and teachers of the school to gift them to the children at Govt. Upper Primary School, Palkulangara, Trivandrum, Kerala, a not so privileged school in the city, to make new friends and to enrich their school library. 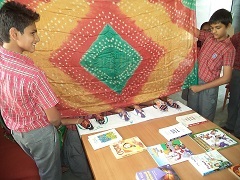 ‘Gift A Book and Get A Friend” Programme has been organized by KV Pattom in connection with the International School Library Month (ISLM) 2013, celebrated in school libraries globally. The aim of this initiative to connect with the people outside the school and share the resources with them. The International School Library day was celebrated on the 21st October 2013 with a theme “School Libraries: Doorways to Life.” The school has participated in the Book Mark Exchange Program and the book marks will be exchanged with schools in USA & Hungary. The Bookmark Exchange Project is a simple, fun way of sharing the pleasure and delights of books and libraries and of making new friends through school libraries worldwide. Our students enjoyed making book marks and shared some messages like save the planet, save the earth, save the animals and about reading. What is being taught in the classroom as a unit is reflected on the book marks. A special thanks to those parents and teachers who spared time to participate in this project. Also thanks to students and teachers who accompanied and guided them to make beautiful book marks. Altogether 300 book marks were made on this day. 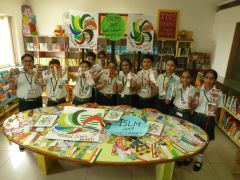 In the second year of the ISLM participation, the school organized a plethora of activities as part of the celebration. 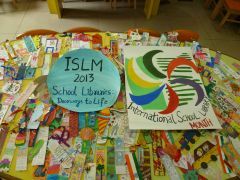 In the first week of October, the library and the school were decorated with a beautiful display based on the theme ISLM. Posters having ISLM logo were put up at various corners fostering awareness related to the event. 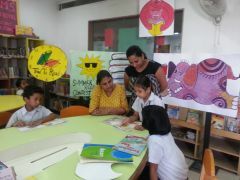 The Library bulletin board was also updated giving information to one and all on ‘International School Library Month’. The junior students participated in a ‘Summer Reading Contest’ whereby they read books relevant to their levels.Winners were awarded medals and certificates. 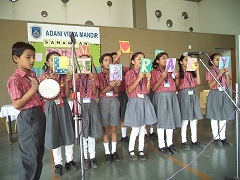 An Inter-House Library Quiz was held in the school premises for classes VIII-X. Students participated in it with lots of enthusiasm. This year it was based on their all time favourite books : - Diary of a Wimpy Kid, Oliver Twist, Tom Sawyer, Three Men in a Boat and The Diary of a Young Girl (Anne Frank). 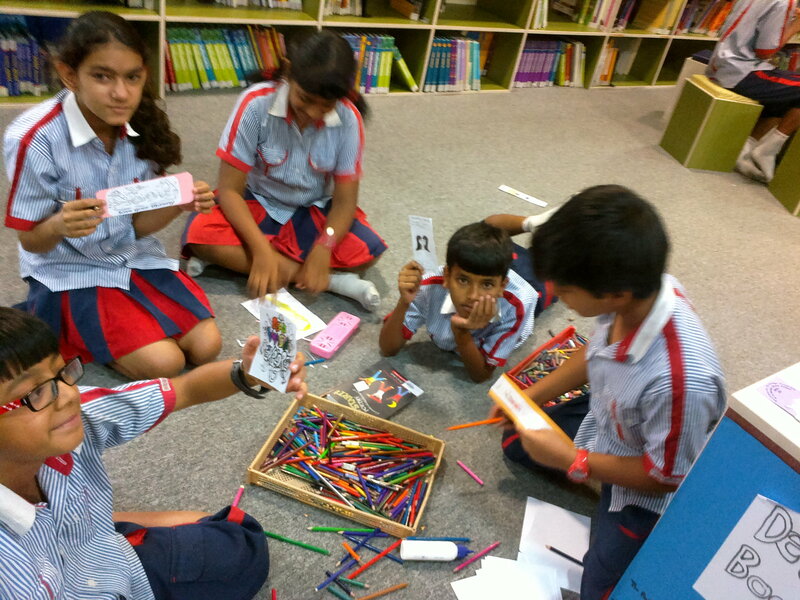 Students were really excited about the ‘BOOKMARK EXCHANGE PROJECT’. This year we collaborated with three schools from USA, CANADA and CROATIA. These were: - Primary School ‘Brace Radica’ Koprivnica (Croatia), Bridger Elementary School (USA), Braidmore School (Canada). Our students made lovely bookmarks giving information about their country, India and sent the same to the schools mentioned above. The bookmarks were really appreciated by the schools and all students learnt a lot about other countries. This year TMS also participated in the ‘Skype Project’ whereby the students had an interactive session with the students of High School "George Moroianu" Sacele – Brasov (Romania). The students shared information about their respective countries, their culture, currency, flags, costumes, festivals etc. 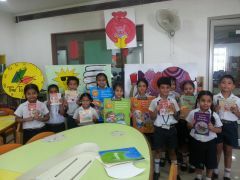 The students also shared information about their schools and also the books read by them. Thanks to IASL, schools all over the world got a chance to interact with each other. Every year one learns so much about different schools across the world by participating in ISLM Projects, be it the Bookmark Exchange, sharing websites or the Skype Project. The success of the ISLM projects is due to the dedicated hard work put in by ISLM coordinators, Adrijana Hatadi (Croatia), Gabriela Ivan (Romania), Sarah Schmidt (USA), and Alison Bodner (Canada). International School Library Month is an opportunity for school librarians to remind the students and educators of the importance of the school library and its role in the students’ learning. G D Goenka Public School, Vasant Kunj organized the Library week from 7th to 9th October 2013 under the guidance of the Principal Mr. D M Sharma and Vice Principal Mrs. Swadesh Kumar. 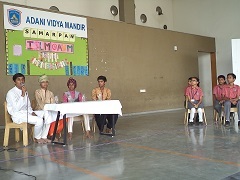 To mark this event, a special act was performed by the students of class 3 to 5.This act depicted the enchanting world of famous book characters and left the students mesmerized and asking for more. 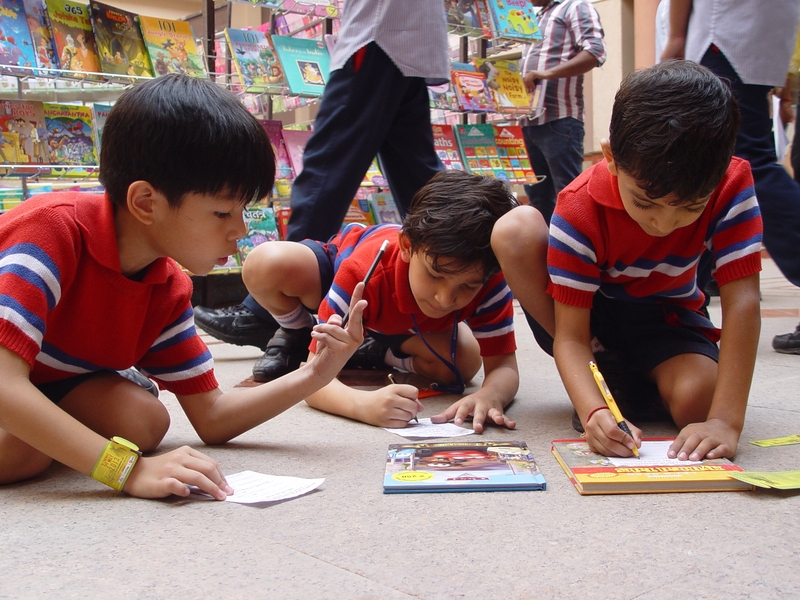 A number of book- related activities including Bookmark- Making, Draw & Describe a Favourite Book Character, Picture Composition, Book- Cover Making , Book- Review, Weaving – a -Story, Quiz etc. were held for different classes in the school. Winners in all the activities were given prizes by the Principal in the school assembly. 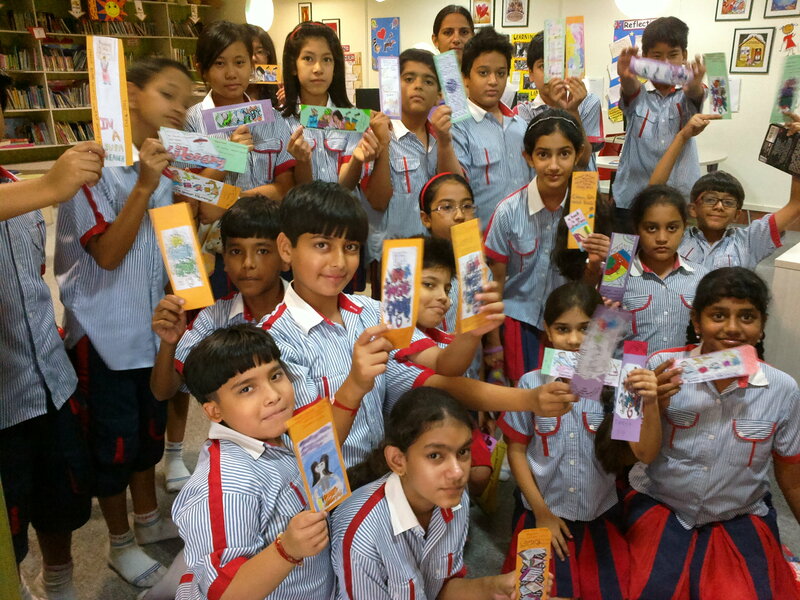 The students also participated in the International Bookmark Project 2013 & exchanged their beautiful bookmarks with two schools in the USA & the UK. In addition, to encourage the good readers, they were acknowledged with the “Readers of the year 2013” award. The aim of the events was not only to encourage reading habits amongst the students but also to explore the treasure of knowledge hidden in the books. The event was a huge success and generated a lot of enthusiasm and excitement amongst the students. Adani Vidya Mandir from Ahmedabad, Gujarat, wishes you all a very Happy Diwali – a festival of lights symbolizing the victory of righteousness and the lifting of spiritual darkness! That’s exactly what libraries stand for! Libraries symbolize the right knowledge, right perceptions and true philosophy. 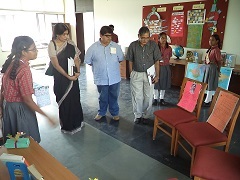 This was our school’s quest for ISLM celebrations this year and it culminated on 28th October, Monday in the form of an exhibition titled ‘Vidarshan 2013’ which showcased a gist of our students’ creations and our library resources. Noted poet of Ahmedabad Mr Rajendra Patel and popular columnist Dr Preeti Shah inaugurated the exhibition which was the outcome of the workshops conducted in the library to promote the use of various resources by students and teachers. While classes three and four explored the genre of Fairy tales, fantasies, fables and folktales in the workshops to create hanging mobiles of their favourite character and dioramas of their favourite scenes in the stories, class fifth and sixth, along with putting up book reports of their readings in the form of mind maps, also indulged in creating origami artefacts and explored the world of poetry – putting up different types of poems, reading poems and writing poems too in all the three languages, namely, English, Hindi and Gujarati! Class seventh students happily turned detectives and solved mysteries for a day as they focussed on nonfiction resources. Students of class eighth indulged in creating story boards of their favourite stories for the reading advertising campaign that they initiated for their friends. 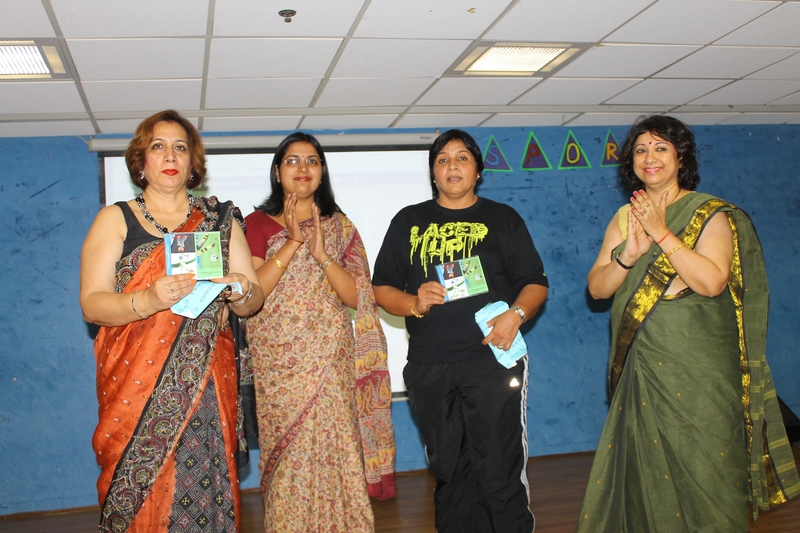 Indian English authors were commemorated by creating stamps of fame of them by the students of class ninth. Class tenth put up a unique puppet show as they focused on the literature in Gujarati language, especially folk literature. Class eleventh put up posters and compilations on the theme ‘Newspapers: Doorway to the World’. The genre of classics was well-explored as they put up author information, quiz compilations, represented in the form of famous lines from the classics they love, the collage of various characters and models containing information about various literary awards. ‘Travel posters’ along with the souvenirs representing the information of the countries they had read about summed up the exploration of geographical resources by students of class twelfth. ‘Friends of the Library’ – the group of students put up a special exhibit of the library skills they had acquired though the years like understanding Dewey Decimal Classification, ‘Five best friends in the Library’ namely Dictionary, Encyclopedia, Atlas, Thesaurus and Yearbook (DEATY) and many more! 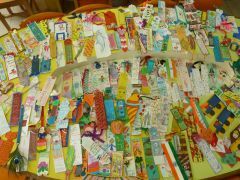 The highlight of this year’s celebration was the exhibit of the bookmarks made by the students for the International Bookmark Project to be sent to the students of our partner schools from Portugal and United States of America. The project became more exciting as the students of classes fifth to eighth worked on different adaptations of the ISLM theme ‘Libraries: Doorways to Life’ as ‘Food: Doorway to a healthy life’, ‘Hobbies: Doorway to a happy life’, ‘Physical Exercises: Doorway to an energetic life’ and ‘Spirituality: Doorway to a contented life’. A special assembly comprising of a poem on books and a talk show which hosted students posing as noted Gujarati writers was put up for the guests to provide a glimpse of our ISLM assemblies conducted in the month of October. 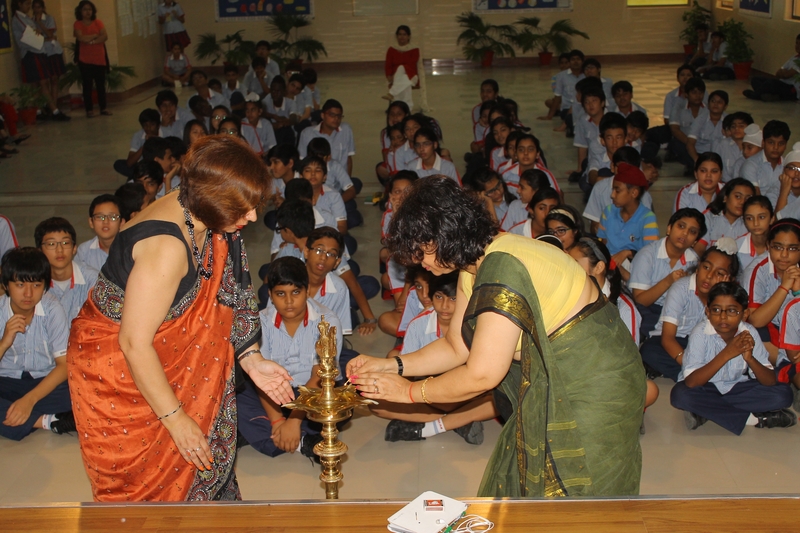 Our director, Dr Bhadrayu Vacchrajani and our principal Mrs Raji Jayaprasad were indeed the torchbearers for this beautiful culmination of ISLM celebration and once again affirmed that the library indeed adds value to students’ achievements in our school!